* Analyzed current trends in penile squamous cell carcinoma (SCC) in the United States. * Determined socioeconomic predictors for locally-advanced 9pT3/T4) disease using National Cancer Data Base (NCDB). * Queried the NCDB, a large, nationwide cancer registry, for patients with clinically nonmetastic penile SCC and available pathologic staging between 1998 and 2012. * Analyzed temporal trends in overall incidence and pathologic tumor stage. * Used a multivariate logistic regression model to identify predictors for pT3/T4 presentation between 1998 to 2012. * Increasing trends were found in all stages of penile SCC. * Significant rise seen in the proportion of pT3/T4 cases (p < 0.001). ** lack of insurance (OR = 2.11; 95%CI: 1.36 – 3.27; p = 0.001). * From 1998 to 2012, there has been an increased incidence of penile SCC and a significantly higher proportion of locally advanced tumors over time. 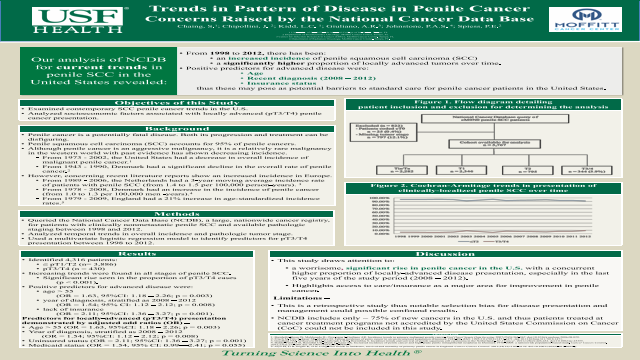 * Age, recent diagnosis (2008 – 2012), and insurance status were identified as positive predictors for advanced disease and thus may pose as potential barriers to standard care for penile cancer patients in the United states.